ehind the blue door of Mariner Realty on Broad Street, the official Office Greeter is on duty. In a wingback chair, head resting on his paws, you’ll find Buddy, a black lab, waiting for visitors. And treats. Sometimes both. 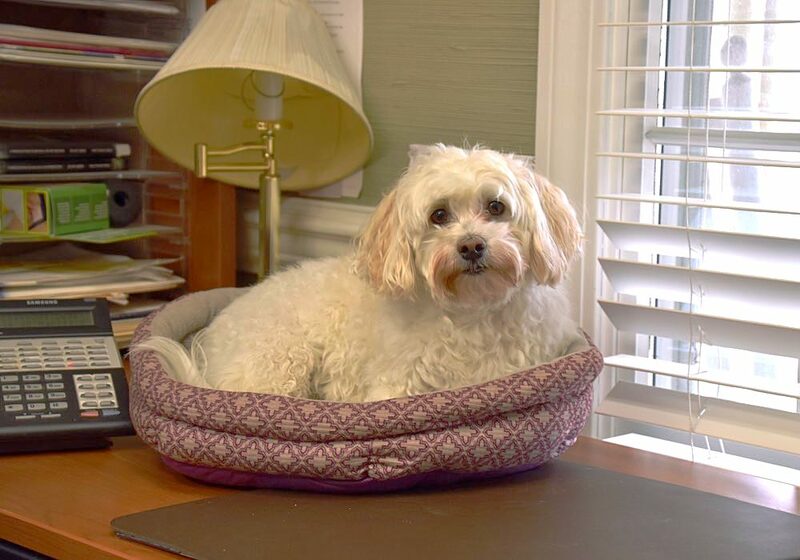 Lounging on a nearby desk is the office watch dog and Buddy’s number one fan, Lily – a small, white, curly-haired Havanese. 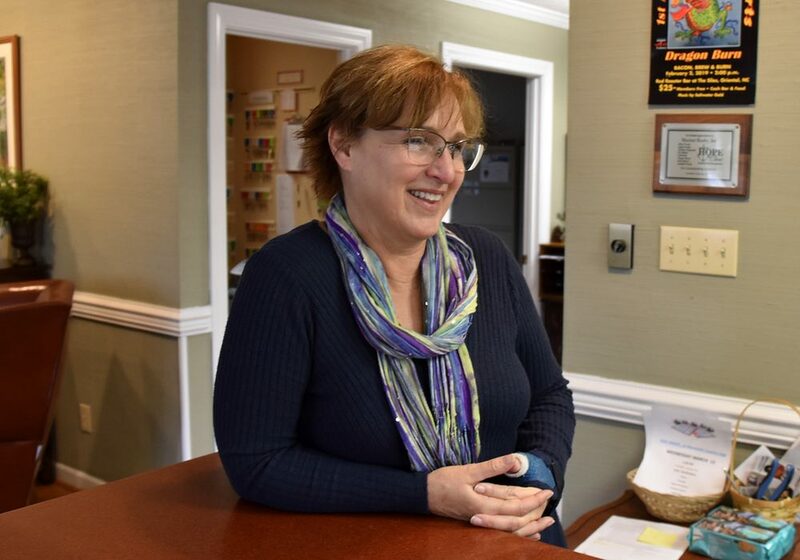 The duo keep office manager Gail Wallace (known as Wally) on schedule. 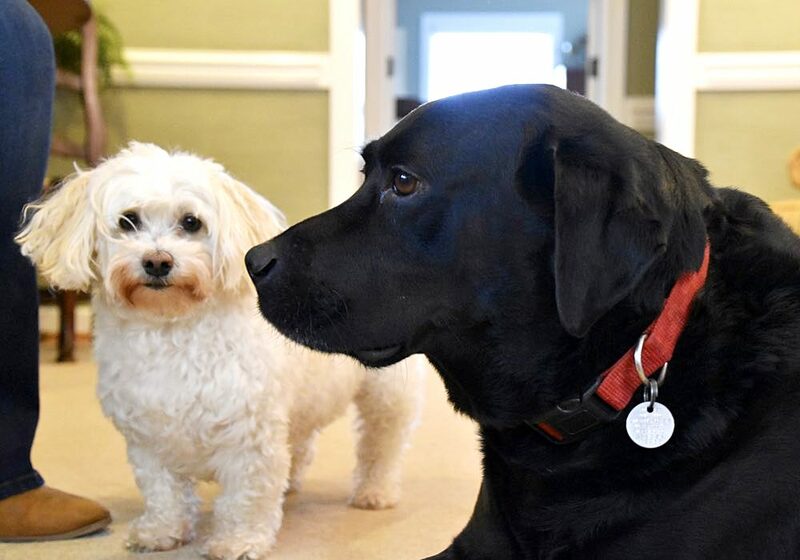 As forAngie and Allen Propst, Angie says, “they fit that part of your life that fills in all the gaps.” For dedication to the family, the business, and to each other, Buddy and Lily share the title of April Pet of the Month. 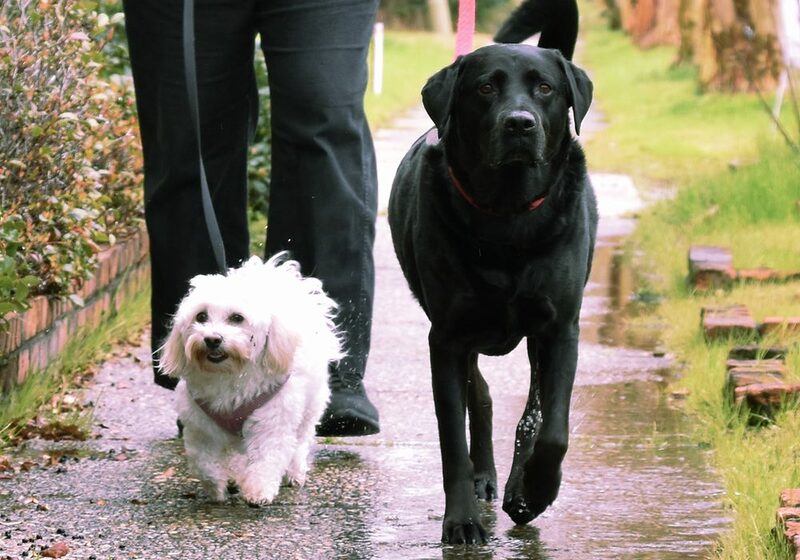 Lily and Buddy, out for a walk. Lily arrived first. This was around 2014, shortly after Angie’s Bichon Frise, Spunky, had passed away much earlier than expected. Initially, Angie didn’t want a dog; to her, there was no replacing Spunky. 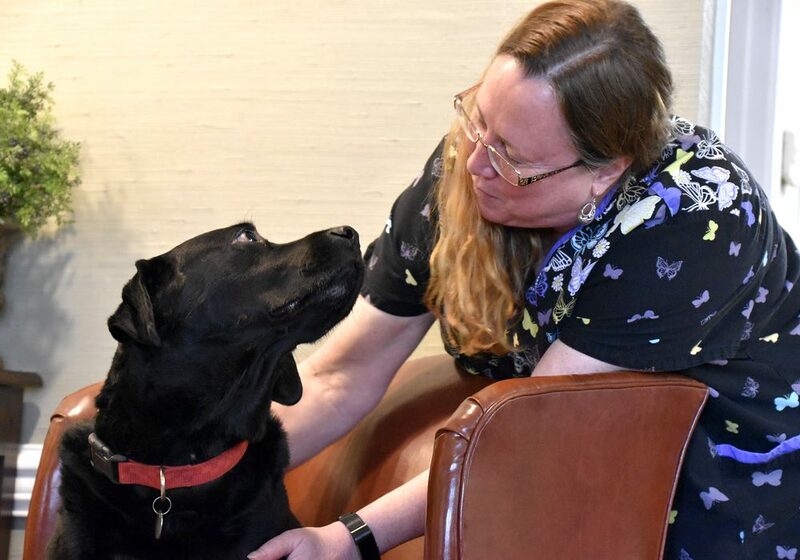 “After about a week of mourning,” Angie told TownDock.net, “Allen said, ‘You’re getting a dog or I’m getting it for you.’” She agreed and began looking. She settled on a Havanese. 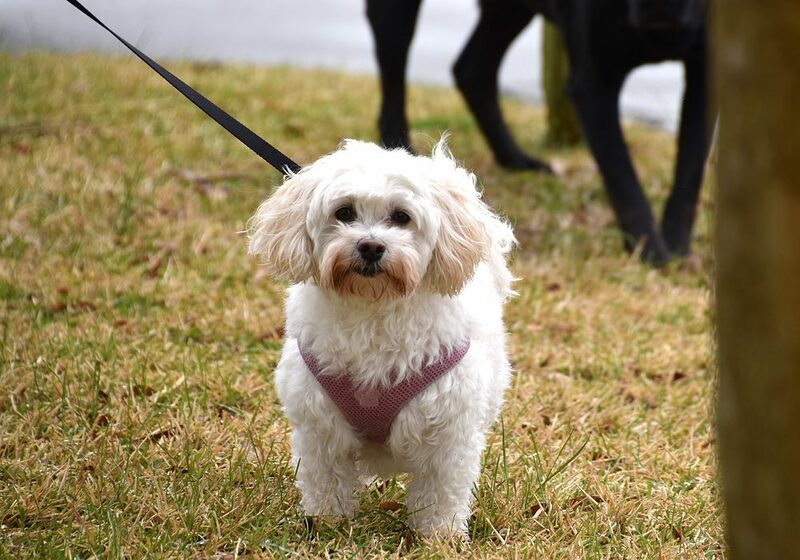 A breed of circus dog originating in Cuba, the Havanese are hypoallergenic – they don’t shed – an important characteristic for the Propsts because their daughter, Madison, had had asthma as a child. 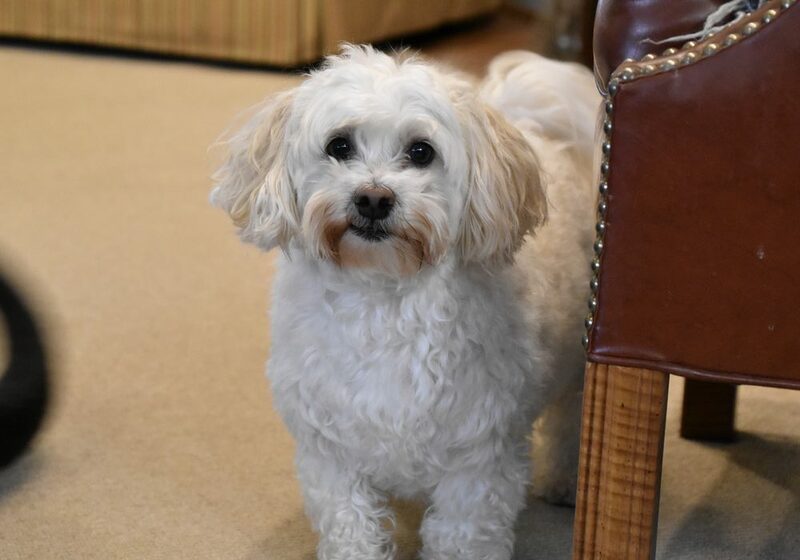 They identified one Havanese that they liked, made arrangements to visit the breeder, and picked up Madison from college on the way. On arrival at the breeder’s, they found puppies playing in a large pen and sighted the larger, buff colored male they thought was theirs. Lily chose the Propst that October. 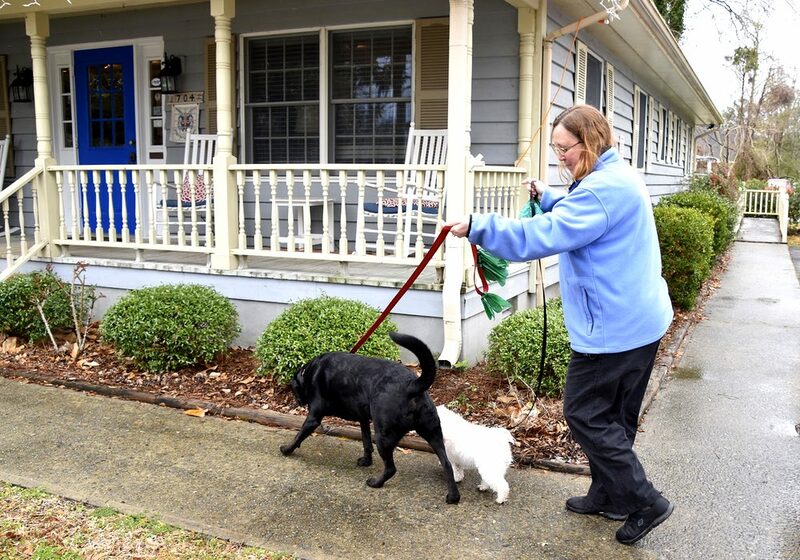 In December, a black Lab with no collar began showing up at the house. About a year old, maybe a little more, the male lab was enormous when compared to Lily. Angie was nervous to let her out when he was around. Wally, with Buddy in his wing chair. Buddy had been a wanderer, the last of his own litter, Angie says. The Propsts wanted to find his owner. Lily had brought Angie and Allen such joy that it was hard think of taking Buddy away from someone. They posted an ad for a lost dog on TownDock.net. The calls started coming in. Callers told Angie to keep him, he was better off with them. But the Propst’s conscience wouldn’t allow it. An owner was eventually found. He said he wanted the dog. Buddy was returned. Angie listens as Wally recounts Buddy’s adventures in Oriental. But Buddy wouldn’t stay there long; he kept coming back. Animal Control Officer Berkley Hill got involved. He’d previously cited Buddy’s original owner for not having his dogs vaccinated against rabies. Hill and the owner had a chat about Buddy’s situation. The owner eventually telling Berkley that the Propsts should keep the dog. It was an arrangement that pleased everyone. Buddy became a permanent part of the Propst family. They got his vaccinations, treated him for a case of heart worms, and had him fixed. Then they tried to keep him from wandering. It was the one thing they couldn’t do. Regular and underground fences didn’t stop him. 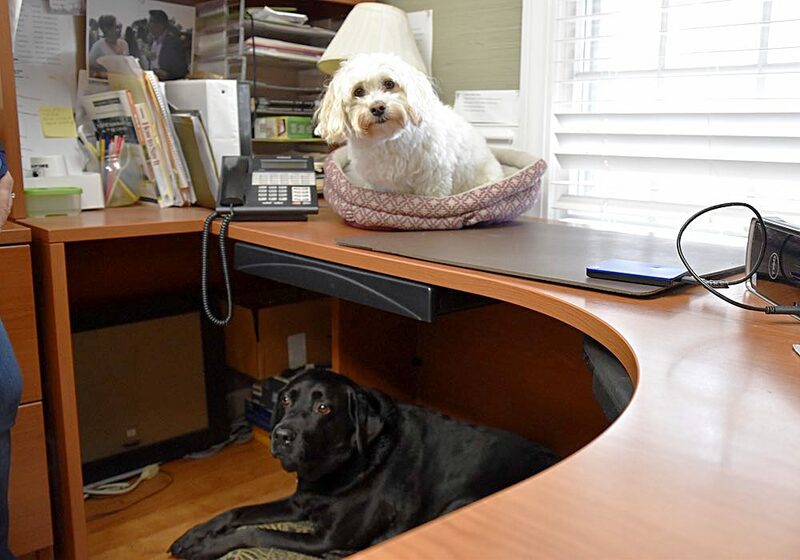 Lily and Buddy take up their posts at Angie’s desk. Buddy had his own rounds and friends before finding a permanent home. His new situation wasn’t about to change that. And so he went about his way, visiting two and four-legged friends, collecting treats, and eventually wandering across Oriental Bridge into town. Calls began coming in reporting Buddy walking himself through town. 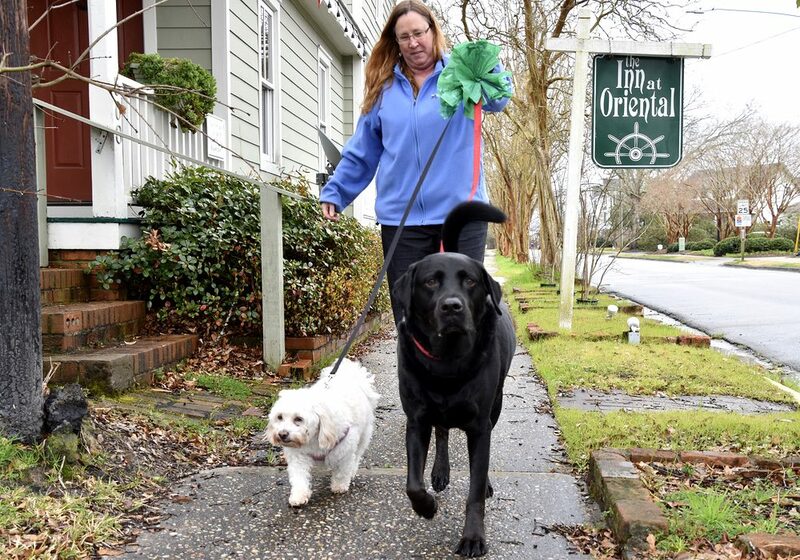 They told Angie the black lab waiting patiently at the door of Mariner Realty. Realizing they couldn’t keep him away, the Propsts starting taking him in to work. It was a better solution than Buddy walking across the bridge by himself. Lily would not be left behind. If left alone, Angie says she would howl until someone returned. 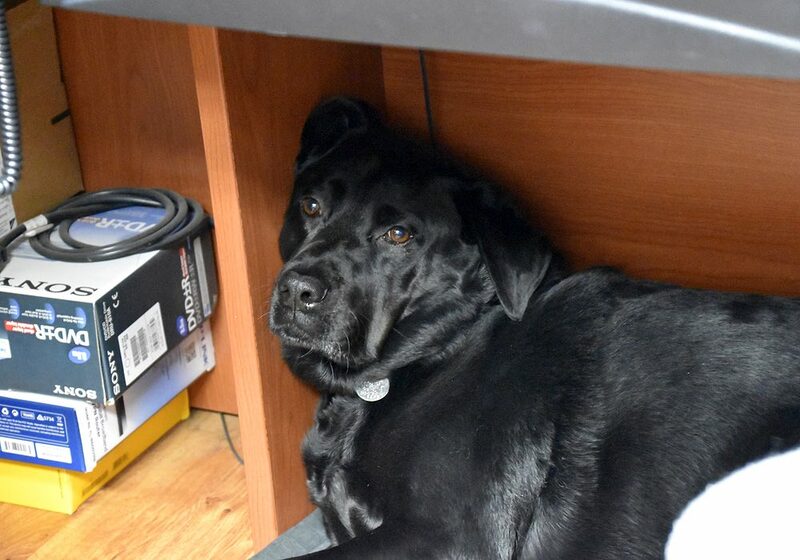 And though Lily is not as good an office dog as Buddy, she’s happy to be on Angie’s desk near both of them. Out for their afternoon walk. It’s not the first time Buddy played the part of consoling friend. Angie remembers when a neighbor dog had cancer. 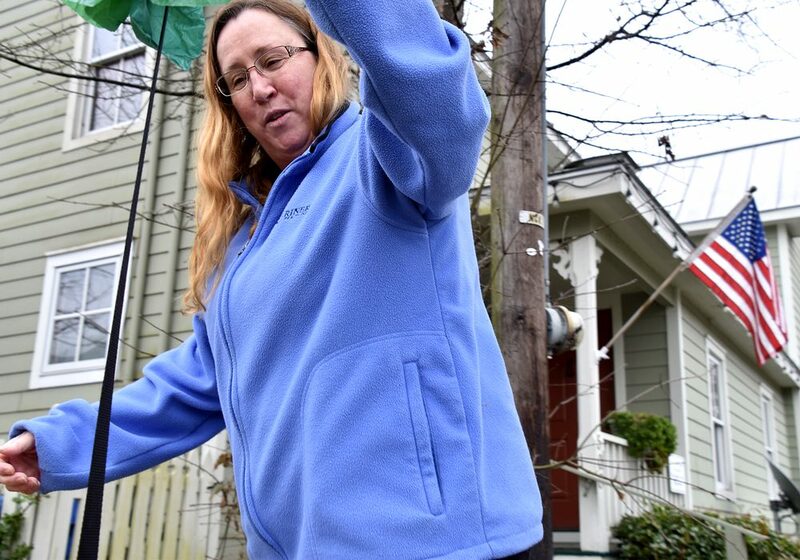 Though she didn’t know it at the time, Buddy would visit the neighbors and try to get their dog to play a little. The neighbors told her that when play was too exhausting, Buddy would lay down next to their dog and put his paw on hers, keeping her company. Returning to Mariner Realty after a walk. Wally and Buddy go for walks as Wally makes her way to the post office or bank. Sometimes Lily joins in. At the end of the work day, the dogs are transported back by one of the Propsts or Wally. They like to be let out at the main road and try to beat the car back to the house. They can often be seen wandering the neighborhood together, keeping an eye out for each other, visiting the neighbors, and playing in the empty lots. Lily and Buddy chose the Propsts and each other. They show up for work and, more importantly, for each other. That’s why they share the title of TownDock’s Pet of the Month.